I am a senior at Lake Central High School in St. John, Indiana. Knowing that I will be furthering my education, I have completed a variety of courses including several honors classes. My current grade point average is 3.9 on a 4 point scale. I have taken the SAT, scoring 1020. I am taking the ACT in December. During the last three years at LCHS, I have participated in several sports. I have been a member of the Varsity Softball Team for three years, the Girls Cross Country Team for two years, and the Freshman Girls Basketball Team. I plan on competing at the varsity level in both cross country and softball again this year. My high school softball team has been talented and lucky enough to compete in the final four teams at the state tournament for two of my last three years. I am an outfielder for the LC Lady Indians. My quickness and eleven years of playing have helped me to play near errorless in the field. This past season, as a Junior, my batting average was .360. My sophomore batting average was .320 and I earned the "Hustle, Pride and Desire" award. During my freshman year, I batted .500 on the Jr. Varsity team and was used as a base runner on the Varsity team. My summers have been spent playing softball since I turned seven years old. I have been a member of the Schererville Sparks team, coached by Glenn Eisfelder, Star Path, coached by Frank Wilkins, and this summer I played on the Indiana Shockers, coached by Pat Roye. My summer teams have been involved in many tournaments and done quite well. In 1997 the Shockers finished fifth at the NSA National Tournament in Chattanooga, Tennessee. I would really like to participate in collegiate softball and remain a good student. My career interests are undecided at this time. While I have developed an interest in sports medicine, I have not completely narrowed my options to that area. Please, feel free to contact me, my high school, or softball coaches with any information or questions you might have concerning my athletic or scholastic abilities. Glenn Eisfelder, currently Manager of the Excel 16U Softball team and Assistant coach at Lake Central HS can be contacted at glenn554@aol.com. 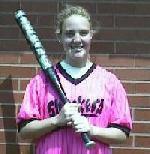 Patricia Roye, Manager Griffith Shockers 18U Softball team at proye@aol.com. E-Mail for Casey can be sent to Pat Roye, she will forward it to Casey. This page accessed times by softball fans like you!